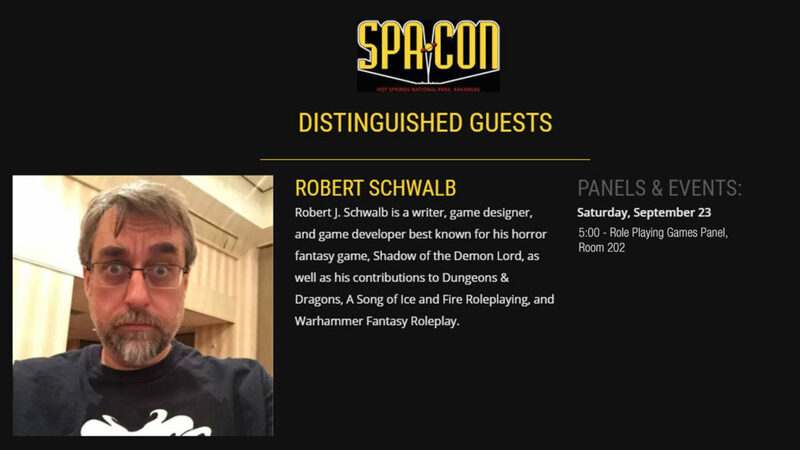 See Rob Schwalb, Distinguished Guest, and play his RPG Shadow of the Demon Lord at Spa Con! Don't miss out on his Role Playing Games Panel with Stephen Radney MacFarland in Room 202 on Saturday, September 23 at 5pm. The first ever Spa-Con was a tremendous success with nearly 4,000 con-goers in attendance including appearances by: Nichelle Nichols (Star Trek); Michael Hogan & Richard Hatch (Battlestar Galactica); Author, Jennifer Holm; Ross Watson (game designer); The DeLorean from Back to the Future; The Mutt Cutts van; a TARDIS, and a sold out Expo Hall full of vendors.